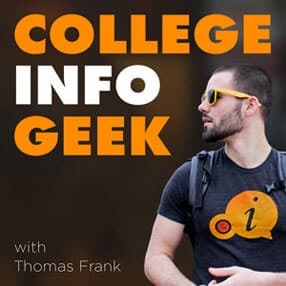 Running College Info Geek has become a pretty complex job. Aside from constantly fielding calls from governments around the world who mistake us for superheroes (it’s an easy mistake to make, I know), there are a lot of tasks we each juggle during any given week. For my part, I’ve got videos to script, film, and edit. I also have to write the articles for each video (which can be lengthy), send out newsletters, develop marketing materials, and answer lots of comments. In addition, I record podcast episodes – both for this show and Listen Money Matters. I answer lots of emails, take business calls, plan out big projects and new features, deal with admin stuff, etc. Martin also juggles a lot of responsibilities: he does all of the coding on new site features (like our brand new Resources page), deals with technical problems, co-hosts the podcast and edits all episodes, and even helps me film. So how do we schedule that work? And, just as importantly, how do we fit it all in with our personal habits? In this episode, you’ll get an inside look at how we structure our daily routines, plan out the order we’ll tackle tasks, and track our habits.